Speed Secret: The more time you spend with the front wheels pointed straight ahead – or near straight – and the throttle to the floor, the faster you’ll be. The steering wheel. It’s almost a symbol for driving. And for good reason: it determines where you go. Well, actually you do, by how you turn it. And that’s what this Speed Secret is all about. Of course, a discussion of the steering wheel – and how to use it – could go on for hours, so I’m going to focus on just two key areas. First, the steering wheel can be a brake – it can slow you down by scrubbing speed with the front wheels turned. So minimize your steering input. How? By looking further ahead. The farther ahead you look, the fewer “last second” adjustments you’ll need to make – your path, or line, will be better planned out. Focus on putting as little input in to begin with, and then deliberately work at unwinding, and straightening the wheel as soon as possible. Second, slow corners usually require quicker steering movements, while faster corners reward slower inputs. To get a car to rotate, or turn sharper in slow, tight corners, you’ll need to turn the steering wheel quickly. 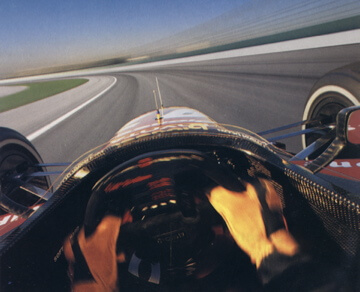 But in long, fast, sweeping corners, you’ll want to turn the steering wheel more slowly. So, turn the steering wheel slowly in fast corners, and quickly in slow corners. Think about it: Practically everything you do with the steering wheel is designed to help you get your foot to the floor on the throttle. Yes, it’s to initiate a change in direction, but then your goal is to unwind it as soon as possible to allow you to get to full throttle. Believe me – I wouldn’t steer you wrong! I quite often get comments on my use of the wheel in some corners where I find it better [ for me ] to shuffle the wheel and move my hands to a place on the wheel that keeps me in better control,to me it seems natural to do this,but other drivers who see my in car camera footage say I should keep both hands on the wheel [quarter to three] and make the turn and not move my hands or shuffle [ I do not like that term it makes it sound like I am driving a bus] it just is more comfortable for me.I race a production car and in a State club series in Australia and am quite competitive in in my class,but of course every little bit helps.